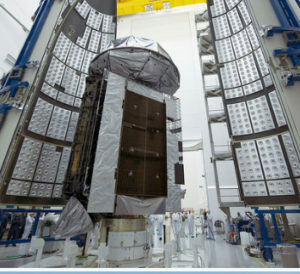 The MUOS-4 satellite, pictured above being encapsulated for its Sept. 2 launch, completes the Navy’s initial Mobile User Objective System (MUOS) secure communications constellation. MUOS-5, an on-orbit spare, will launch in 2016. Following the completion of successful on-orbit testing, on Nov. 30, the U.S. Navy accepted the fourth Lockheed Martin-built Mobile User Objective System satellite. Launched Sept. 2, MUOS-4 is the latest addition to a network of orbiting satellites and relay ground stations that is revolutionizing secure communications for mobile military forces. Users with operational MUOS terminals can seamlessly connect beyond line-of-sight around the world and into the Global Information Grid. MUOS’ new commercial, cellular-based capabilities include simultaneous, crystal-clear voice, video and mission data, over a secure high-speed Internet Protocol-based system. MUOS-4 will be relocated in Spring 2016 to its on-orbit operational slot in preparation for operational acceptance. 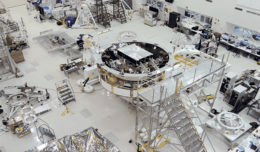 The satellite joins MUOS-1, MUOS-2 and MUOS-3, launched respectively in 2012, 2013 and January 2015, and four required MUOS ground stations. MUOS-5, an on-orbit spare, also will be launched next year. Once fully operational, the MUOS network will provide 16 times the capacity of the legacy ultra high frequency communications satellite system, which it will continue to support, and eventually replace. More than 55,000 currently fielded radio terminals can be upgraded to be MUOS-compatible, with many of them requiring just a software upgrade.